Large-scale phylogeny estimation is challenging for many reasons, including heterogeneity across the Tree of Life and the difficulty in finding good solutions to NP-hard optimization problems. One of the promising ways for enabling large-scale phylogeny estimation is through divide-and-conquer: a dataset is divided into overlapping subsets, trees are estimated on the subsets, and then the subset trees are merged together into a tree on the full set of taxa. This last step is achieved through the use of a supertree method, which is popular in systematics for use in combining species trees from the scientific literature. Because most supertree methods are heuristics for NP-hard optimization problems, the use of supertree estimation on large datasets is challenging, both in terms of scalability and accuracy. In this chapter, we describe the current state of the art in supertree construction and the use of supertree methods in divide-and-conquer strategies, and we identify directions where future research could lead to improved supertree methods. Finally, we present a new type of divide-and-conquer strategy that bypasses the need for supertree estimation, in which the division into subsets produces disjoint subsets. 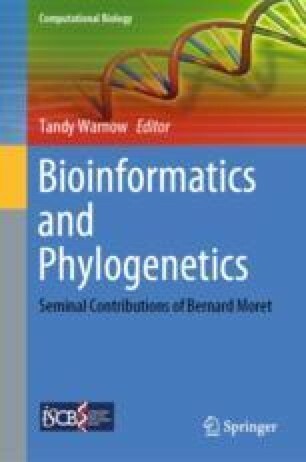 Overall, this chapter aims to present directions for research that will potentially lead to new methods to scale phylogeny estimation methods to large datasets. The author wishes to thank Pranjal Vachaspati for careful and thoughtful comments on the manuscript. We also thank the anonymous reviewers whose comments were helpful in improving the manuscript. This paper was supported in part by NSF grant CCF-1535977, but much of the work described in this book chapter was done while the author was part of the CIPRES (www.phylo.org) project, an NSF-funded multi-institutional grant that was initially led by Bernard Moret and then subsequently by the author. The first divide-and-conquer methods (DCM-NJ, DACTAL, etc.) were developed with CIPRES support, as were the supertree methods SuperFine and the Strict Consensus Merger that enabled those divide-and-conquer methods to have good performance.